An organisation’s culture is a reflection of what people think, feel and believe. It’s made up of patterns of behaviour and ways of thinking that shape how things get done. In essence, your culture is the habits of your organisation. The way we work is changing … it’s no longer enough for businesses to keep doing what they’ve always done. The challenge for leaders today is to inspire employees to care about what matters most, and be motivated to deliver it every day, for every customer. Attaining this at a time when customer and employee expectations are higher than ever before, and employee engagement is at an all time low, requires leaders to be intentional about nurturing a culture where everyone has a shared understanding of what matters most – and a shared responsibility for bringing your strategy to life. At Salple, our purpose is to help leaders excite and delight the human spirit. We work with leaders and employees to co-create and activate deeply authentic, powerful “Culture Codes” – creating alignment that connects and engages your people with their specific role in bringing your business goals to life. We believe this is the competitive advantage of a new era. A Culture Code gives everyone a shared understanding of what matters most. Whilst it can exist in a written document, the real power in a Culture Code is how it is lived. More than just words on a page, an activated Culture Code provides alignment and a shared understanding of what matters most, allowing employees to focus less on deciding what to do, and more on simply doing. When that’s also aligned with your strategic goals and a desire to deliver the experience your customers are looking for – it provides an exceptional competitive advantage. Culture Codes articulate why you exist (Your Purpose or Mission); Where you want to go (Shared Ambition), and How you want to work together to advance your Purpose (Values and Behaviours). A Culture Code co-created with your employees gives everyone a shared understanding of their individual and team roles, and a shared responsibility for bringing your purpose to life. For a “Culture Code” to be lived through-out your organisation it needs to be co-created with your employees, rather than imposed on them. When all employees have input into the values and behaviours expected of them, it is a powerful lever of engagement and ensures everyone has a shared understanding of what matters most; and a shared responsibility for bringing your purpose to life. Why is co-creation of your Culture Code so important? Co-creation gives everyone an opportunity to be part of creating the future. After all, it's your people who really know and understand what works and what doesn't about the way you do things. And it's your people who are mostly responsible for delivering the customer experience you want. Co-creation also uncovers a core group of employees who are passionate about your culture. And because they were integral to building your new culture code, they will become fans and defenders of it; holding themselves and others accountable for its values and behaviours. These culture champions will spearhead behavioural change in your organisation as you seek to live authentically by your culture code. Over time, they'll attract and mobilise more people to the cause, leading to your whole workforce becoming aligned and proudly living your culture code. 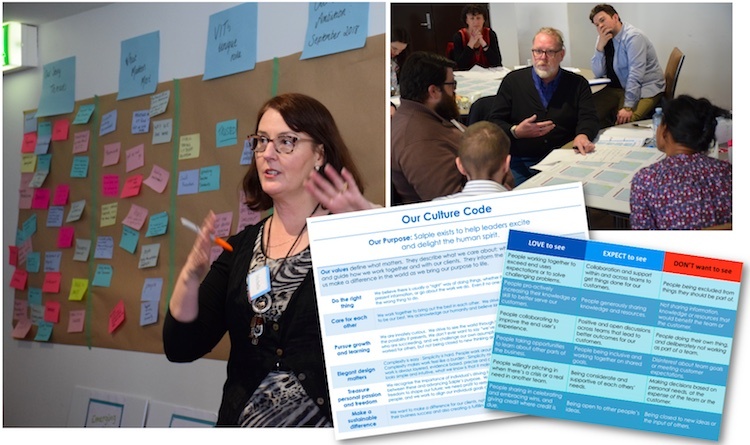 How do you co-create an authentic, living Culture Code? There are 4 stages to building an authentic, living culture code. Explore, Align, Engage and Activate. The Explore Phase provides valuable insight into your culture today through the eyes of customers and employees. We build from what you already know, drawing on the collective wisdom of the people who know your business best. We take the pulse of your company’s culture today, and measure current engagement levels. Our approach is strongly informed by research. Research we’ve done ourselves with Australian business owners, and also what we’ve learnt from the research of experts around the world. We want to make sure we’re focusing effort on areas that are known to make a difference. Our “Drivers of Employee Engagement” model, is an example of this, and during our Explore phase we specifically measure these areas in your organisation with our engagement survey to ensure that your culture supports achieving your strategic objectives. At Salple, during Stage 1 we interview your leaders and informal leaders; conduct a company-wide survey of engagement and trust levels; and (optionally) survey your leaders’ behavioural preferences using a deeply insightful tool called Harrison Assessments (which helps your leaders understand how their patterns of behaviour currently shape the culture). A critical driver of success in business today, is alignment within the Senior Leadership team. A shared understanding of the strategic direction of the business and the values that drive business practices will be articulated and form the basis of your ”Culture Code”. In our Align stage, we review the current culture landscape based on the Explore outputs. We explore the desired future, by building on the story of your business so far, and uncovering and articulating a draft Purpose, Shared Ambition and Values that will form the foundation of your “Culture Code”. This draft will be further refined in the Engage Stage. Alongside, this we use the Harrison Assessment analytics from the Explore stage, to really understand the dynamics of the leadership team and the impact their behavioural preferences are likely to have on the desired culture. At Salple, we’ve crafted and refined a very specific alignment process for Stage 2 that takes your leaders on a journey though the history, present and future of your company where we draw out the threads of the story you collectively want encoded in your Culture Code. We use a variety of techniques including Narrative Enquiry, LEGO Serious Play, Affinity Mapping and Harrison Paradox Graphing to tap into the rational and intuitive parts of the brain as we build a detailed picture of the existing and desired culture for your company and the enablers and potential derailers. Company values that are imposed on employees, don’t create great engagement. Our methodology draws heavily on co-creation to ensure employees are engaged, excited and feel part of the future. Our “Head, Heart, Hands” approach ensures employees understand (head) your purpose, key aspects of the business goals and how their role contributes to the desired outcome; Emotionally connect (hearts) and feel a shared responsibility for the outcomes because they care about what matters, and know in practical terms (hands) what they need to do. This makes a significant difference in terms of engagement, ensuring that in the moments that matter, people make decisions, recognise opportunities and work together in ways that advance your organisation’s purpose. At Salple, our Engage stage 3, typically involves a workshop with all employees, where the draft Culture Code from stage 2 is worked on to finalise it. This includes any refinement needed to the values and identifying the behaviours that will bring the values to life, through our simple and practical “Love to see”, “Expect to see” and “Don’t want to see” framework. Ensuring all marketing materials are aligned with the Purpose and Values. Reviewing recruiting and on-boarding practices to ensure the “Culture Code” is core to the process, and that you are attracting and recruiting people who will fit your culture and therefore thrive in your environment – and are more likely to succeed and stay. Ensuring training and development opportunities are aligned with the “Culture Code” and advance your purpose. At Salple, we get involved with the Activation stage 4 to varying degrees depending on the client. One or more Activate Workshops are a great way to launch the final Culture Code and the desired customer experience to all employees. Using the organisation-wide behaviours of the final Culture Code, in an Activate Workshop, employees and teams drill down into exactly what those behaviours mean for them in their day to day work and processes. We also have a software platform to help you activate your Culture Code and keep it alive and fresh.